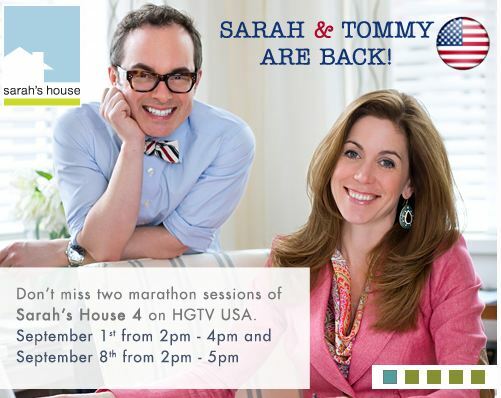 Did you catch the marathon of new Sarah’s House episodes on HGTV last weekend? I missed it and was totally bummed. However, I see that another marathon is scheduled for this Saturday. My DVR is scheduled to record this time, and I can’t wait to see how her latest house project turned out! Of course our Canadian friends are always ahead of us in all-things-Sarah, so it’s old news to you guys. But here in the U.S. we’ve been patiently waiting for the new 4th season to air for what seems like forever. Considering Sarah Richardson is one of HGTV’s most popular personalities, I’m kind of baffled by the way they’re burning off all the episodes in big batches. The kitchen is undeniably gorgeous. But I’m that stick-in-the-mud who just can’t seem to get into the gray trend, so I’d need to add some color if I actually cooked in here. Pretty to look at, though! One of the most popular posts on my blog is one I wrote about Candice Olson (All About Candice Olson and Her Divine Designs), and I get lots of requests to write about Sarah Richardson, too. Based on the amount of email and comments I get about the two of them, they’ve got to be two of HGTV’s most loved personalities. Was born in Toronto, Ontario. Had the nickname “Mother” as a teenager (taking care of everyone). Received a B.A. in Visual Arts from The University of Western Ontario in ’93. Started her television career as a behind-the-scenes prop stylist and set decorator. Runs the successful design firm Sarah Richardson Design Inc.
Has hosted the 5 shows: Room Service, Design Inc., Sarah’s House, Sarah’s Cottage (called Sarah’s Summer House in the U.S.) and Sarah 101. Has a paint collection that’s available in Canadian Lowe’s stores. Is married to childhood friend Alexander Younger, the founder of Design Lab. Lives in Toronto with her husband and their daughters, Robin and Fiona. Check out this entertaining interview with her at Your Home for more stories about her life. There’s a fun Q&A with Alexander & Sarah on 2Profile (photo by Kourosh Keshiri). You remember that fabulous cottage, don’t you? It was featured on Sarah’s Summer House and had us all swooning. You can see the entire slideshow of cottage photos over at HGTV.com. Are you a fan of Sarah’s, too? Don’t forget to tune in Saturday to see how this season’s house came together! HGTV Design Star: Did the Right Designer Win? Missing Ahmed on Yard Crashers? Why Did Designer Roger Hazard Leave "Sell This House"? Count me in as a devoted Sarah fan! She is the one designer I would allow into my house with free reigh to do whatever she wanted, no questions asked! I completely agree. She and Samantha Pynn (Summer Home) are the only designers I would happily hand over my keys and money to and say “have at it”. I absolutely agree. Sarah Richardson’s the best in my book!!! Wow, really?? Sounds like you don’t recognize talent. I also am a fan of Sarah’s, love her shows. You know we have seen this series in Australia as well, earlier in the year I think, on our pay tv channel, Lifestyle Home. I didn’t realize you got it in Australia before us! Wonder why it takes so long to reach HGTV in the States? She got a lot of flack over that blue dining room (with the horse picture). Aside from the horse picture, it was hands down my most favorite of all the dining rooms she’s ever done. I’m with you on the gray trend. Hate it so much. I would have at least put in some splashes of a deep merlot color, in some of the accessories. Any color, really. Glad I’m not the only one here who would need more color in the kitchen. I actually start feeling depressed if there’s too much gray around me. I can appreciate that it looks nice in photos but wouldn’t be able to live with it. Interesting that she got criticized for the blue dining room. Sounds like it’s not a favorite with some of you here, either! I’m just not sure I would have chosen the horse picture. Aside from that, I love that dining room. I love dark blue walls! Gorgeous! I love it and am wondering if anyone knows where the horse painting/picture is from? WOW – Our US Friends gushing about a Canadian Designer!!! She is really good and does some great stuff. I did not see the show but it was shot in the Town I work in and was later listed for sale as “Sarah’s House” – for over 1 Million (Canadian) fully decorated & furnished!! Oh, yes, we love ’em! Very interesting that it was listed for over $1 m and remained fully furnished. Imagine being that lucky buyer! Sarah is AMAZING! I caught the marathon last weekend and loved every minute of it. I appreciate how they always tell how much they spend. Love the way they mix colors and patterns. Love the way they miss old/vintage with new. Her mix of formal sophistication with whimsy is spot on every time. I found this interview interesting. I was surprised to find out that you could be on Sarah 101 and never actually meet Sarah! That is interesting! I don’t think we’ve ever gotten Sarah 101 here in the States so I’ve never seen the show. Wish I could. Thanks for the link, Kristen! They actually did show Sarah 101 on HGTV in the States. I actually almost missed it, but stumbled across it one Saturday night and was lucky enough to be able to catch up on re-runs. It always boggles my mind why they don’t promote the heck out of her series since she’s so popular. I think I may have seen -one- commercial for Sarah’s House on HGTV a long time ago. Thankfully I set up my DVR for all ‘Sarah’s House’ to automatically record or else I might have missed this go around too. You can still look up the 101 pictures on the HGTV website. Sara is by far the most talented designer on HGTV. But clearly that channel doesn’t understand her, I suppose because she is not the product of some idiotic reality/game show to become a “top designer on an HGTV – let me crash or tear apart your house, room, bath or yard” show. Love Sarah, she is very talented. Her designs are my eye candy! I agree with you on the grey kitchen though, I wish there was a little more color in there. she’s wonderful. i used to watch her many years ago (i think it was room service?) and she always had a little segment where she’d teach you how to make something, like sew an apron, or make an accessory for a room. she wasn’t afraid to work with tools. her designs were always simple and beautiful, very down to earth and elegant at the same time. i lost interest as she started doing more and more work for high-end clients (design inc?) and i don’t follow her shows now but if i ever catch the end of a show, i am always impressed by her work. and i love any segment where she is second-hand and fabric shopping, such fun the way she pulls things together. she’s such a great canadian talent and i’m proud of how far she has come. and totally jealous of her cottage! lol thanks for this article and photos. I read in one of the interviews that I linked to above that she taught herself to sew when she was 5. I remember those segments you were talking about when she’d teach you something. Then she kind of went more glam in subsequent series–both in her personal look and in her projects. I loved Room Service. I feel it was her best show, although I do love the others too. Design Inc. was great. I tend to enjoy the Canadian shows more than the U.S. ones. I think HGTV here needs to take some lessons from Canada. I always joke that all the employees at HGTV – U.S. must be on vacation. They sure aren’t putting a lot of thought into their shows. I also wonder why they are having a marathon of Sarah’s show? Spread it out and give us something to look forward to on HGTV! I agree. They could have made this must-see TV in prime time all summer–I know a lot of us would have tuned in every week! I was doing just fine till the dining room. The fish-eyed pic of a horse gave me a flashback to when I was 5 and that was the last image I remember before my sisters horse tried to eat my hair. Ha! Yeah, that horse is very life-like. Sorry to traumatize you, Billy. thanks for sharing this! I’ve loved Sarah since her early Room Service days. 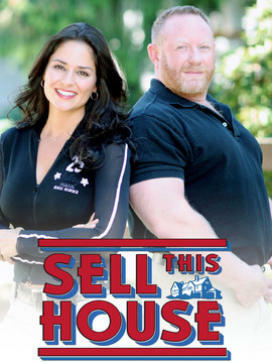 My one question with her show Sarah’s House is, does she actually live in all the houses she remodels/designs or does she just sell them when she’s done, furniture and all. I know she does own the summer cottage and the house out in the country (not sure of the season, maybe 2?). But the others? the old victorian in the city, the mid-centry back split, and this newly built home in the suburbs…..are they hers for real???? No, she doesn’t live in them. They’re just for the show and then they’re sold, as far as I know. The first Sarah’s house was sold very quickly. The purchaser had the option to buy the furniture as well and bought it – everything as is! The second Sarah’s house was put for sale but then the market went soft. Sarah held on to the house for a while (I believe her father moved into it) and then it was sold. The house has been resold a few times since – and redecorated and all the “Sarah-ness” was taken out of it sadly. This last house in the suburbs sold quite quickly after the show as well. As a Canadian, I’m so glad you are so fond of our Sarah. I really think they should have stretched out the shows for you though! She really is the best thing on HGTV, north and south of the border. Thanks for the additional info and the link, Jen!! Sarah kept the farmhouse and also the cottage on the lake. All the others were sold (with or without furniture). The second Sarah’s House, a back split, was sold a few years later and there were photos of the house RE-DECORATED!! – needless to say Sarah’s decor was slightly better 🙂 I’ll try find the photos for you for a “before and after”. Absolutely LOVE Sarah and Tommy! A few other great Canadian designers (of course all female) – Candace Olsen, Jane Lockhart, Samantha Pynn, Kelly Deck and a former “Bachelorette” star Jillian Harris. I’m glad to hear she kept the farmhouse, too. No way could I part with that one. Thanks for the additional info, Linda! here’s a link to a blog about the “re-decoration”. To see the original photos check on Sarah’s website. Oh my giddy aunt – that redo is HIDEOUS! Her cottage is absolutely lovely but her farmhouse was the be all end all for me. The red doors in the mudroom, the yellow island in the kitchen, the numbered staircase…be still my heart! Oh, yes–loved that farmhouse, too! I’m with you, Melanie. That farmhouse with the red was to die for! The mudroom to beat all other mudrooms! I love the cottage! I’m with you on the gray thing, I think it will get so dated like everything else that’s trendy. Also not a fan of the horse face in the dining room. Anyhooo, her cottage is so dreamy. Thanks, Julia , I am going right now to set my DVR for the September 8th show…. Thanks so much for posting this as I was unaware of her shows being shown tomorrow. They are all dvr’d and ready to go. My favorite designers on HGTV are Sarah and Candance while the others are lack luster dolts. Plus I am sick of all that heavy metal rock music they play when they destroy everything in site. Love Sarah! I must have watched every episode of Design Inc two or three times while my newborn napped on me. It was the best show. Oh boy I love Sarah. I watched all of the Summer House episodes, and I wanted a cute little ‘bunkie’ all for myself after watching her cottage come together. Oh, yes, the bunkie! I want one too. i did watch the show the house is fantastic the only room i didn’t really like was the dining room everything else perfect. I love all things ‘Sarah’ and also don’t understand why they’re lumping all these shows together…? Programming on HGTV (US) is getting lame these days. Wanted to also give a shout out to Tommy – how talented/funny/likable/adorable is he?! Gosh, being a Canadian living in the US, I’m just thrilled too see all the Americans who love Sarah and the other Canadian designers, not to mention Mike Holmes! It’s true that the shows always air a couple of years ahead up there, it still baffles me why they don’t run simultaneously in the US?? My mom and freinds in Canada alwasy talk about Sarah’s latest work but I never get to see it until years later! Sarah is the best, best, best! I love and adore her shows and Tommy, too. Thanks for letting us know about tomorrow, I will for once, tune in to HGTV – they lost me when they started all those real estate shows! THANK YOU! I wouldn’t have known about the marathon otherwise! I adore Sarah’s House!!! Sarah is my favorite Canadian designer. I watch all of her shows and she’s truly a big inspiration for me. I love Sarah, but I think I might love Tommy just a TAD more. Follow him on Facebook. He posts some interesting stuff. His (I think) sister is a fashion designer and made that navy blazer that we’ve seen so much on Kate Middleton. I record every Sarah episode that comes on HGTV and when I am in a bad mood, I run them all. Sarah’s designs are always happy. I’d take the farmhouse and the island weekend retreat in a nanosecond. Her new show (or new to me anyway), she took a run-of-the-mill builder’s spec house and upgrades the interior with a $100,000+ budget. Darn, I missed last weekends marathon too. I wont make that mistake this weekend. I’m with you on the gray thing. From the pics, this may be my least favorite of her homes :-(…only for the lack of color. I love her and Tommy though! THANK YOU, JULIA, FOR POSTING ABOUT THE SARAH RICHARDSON MARATHON!! (<==All caps intended to express my extreme appreciation, not yelling at you! LOL) I would have been heart-broken to miss it! I love Sarah Richardson! And another big thanks to whomever posted about Samantha Pynn (Summer Home) – I had never heard of her, but after checking out her portfolio…well, I hope HGTV US puts that show on here, as well! There are so few shows I get excited about on HGTV US these days. Maybe, just maybe, someone out there in programming will see all the enthusiasm here and beef up the US line up a bit. I LOVE the designers from Canada! Thanks, Melanie! I’ll go check it out! There’s not a single room that I don’t love! The thing with the gray kitchen is that you CAN add color, if you choose. And Tommy rocks! I’m off to record tomorrow’s marathon. Yay! I guess I’m the odd one out, I think she’s totally over rated and does third rate design. Painted “lacquered” furniture, tacky prints, wonky scale, very derivative. I suppose she’s one of the best on HGTV but that’s hardly saying anything at all. Really, it surprises me that she does so well but then I think in a city like Toronto you get the design and designers you deserve. Tommy Smyth, however, is truly talented – he should have his own show. He clearly has a knowledge of art history, decorative arts and the history of design and doesn’t just vomit trellis in green and turquoise everywhere. He’s too good for the masses. Not to be snooty but true. I totally agree, I have found it hard to watch most design shows because I just didn’t click with their style. Sarah’s work is exactly what I love and it’s good to have variety in design. Just like fashion, not every style is for everyone. I love Sarah Richardson. Interesting to see how her personal style has changed so much over the years (from an appearance perspective) – loving that long hair! I love Sarah and her shows and rooms. However, I hate how snooty all these designers are. Last Sat. Tommy suggested they could use laminate in the kitchen and she couldn’t believe it and ceramic tile would not do, they had to have marble tile, etc. And a basic builder house that is 3700 square feet? Get in touch with reality. Maybe, but I thought the point of that show was to take a basic builder house and upgrade it into something custom. Which would include the upgraded materials. While she was working with a large budget, she still made compromises so that she could really splurge in some areas. Love her!! Thanks for featuring her on your blog!! I love the pictures of her cottage – it is so fun to mix up different chairs at a farm table and to mix up the modern with the rustic. So warm! Does anyone know where I can find the episodes that aired last week online? I had no idea HGTV ran the first part of season 4 last week, have my DVR all set for tomorrow but would LOVE to see last week’s episodes! I did see that HGTV Canada’s sites have the videos available, however, you are not able to access them if you are not located in Canada. Thanks for any suggestions! Love Sarah Richardson!! HI – I am a Sarah fan too, but want to comment on HGTV’s sidelining her and others in favor of these “fix up my house so I can sell it” shows. Enough! And these stupid contests to win a show are so done. I don’t watch HGTV anymore because there is so little to learn and inspire. I keep Sarah’s House in my DVR so it will record when its on because she gives ideas for real budgets and quick fixes that bring smiles and joy. I have always loved Sarah – such impeccable style. Truly the only redeemable thing about HGTV these days…. I think Sarah’s houses are gorgeous to look at, but I wouldn’t want to live in them. They are too perfect and formal for me. I do appreciate the beauty of them though, and I think she and Tommy are adorable together. Maybe when you’re decorating without real clients in mind, the houses tend to lack soul? I liked the horse picture just because it was quirky and seemed to show some personality. It was the only unexpected moment in the house. I love Sarah’s decoratint style. Although, I’m like you, I just can’t get into the gray trend, especially in a kitchen. It just looks so depressing to me. Sarah is FANTASTIC!! Love her show and yes bummed they are doing a marathon of shows. My DVR was set & is set. Wish they would still show the Sarah 101 series. I also loved Debbie Travis..wish they were still on.. OH lunch time for my job..gotta go! I always look forward to getting on your site!! It’s all very pretty and tastefully arranged and each room, except for the dining room, looks like the cover of a magazine, or an upscale hotel. You have absolutely no sense of anyone actually living there. It’s pretty but it’s not a home, it’s not that 1925 Craftsman in Mississippi. I suppose that is the nature of professional designing. The dining room is my favorite, it has some quirk to it, and for once none of that sorrowful gray. If that was your horse, you would love that picture. My mother has a very large picture of her favorite horse in the entryway of her house, and it looks great. It does help that he isn’t coming at you nose first, like this one, but this dining room horse has a sweet face and needs his nose kissed. Best post ever!! Especially the part about kissing the horse’s nose. Best to you and your mother. I absolutely love Sarah! I love anything she does (maybe not so much Sarah’s Cottage, lol) She is among my favourite designers and TV personalities – along with Genevieve Gorder. I was so excited to see Sarah’s House 4 was finally coming to the US but I don’t understand why our HGTV isn’t showing all the episodes! I feel gypped! They skipped the important “Find and Buy” first episode (which lays the ground work for the whole project) and it looks like the Girl’s Bedroom and the all important finale aren’t scheduled to air here at all. The series isn’t gutted but really important stuff was taken out and it won’t be the same. I wondered if my DVR messed up with not having the girls bedroom or the first find and buy episode. Seemed odd to me – glad to know it wasn’t a faulty DVR. I just don’t get HGTV these days. Who cares about buying and selling anymore?? Show me how to decorate my house on a realistic budget….not how to sell it. OMG–so did I!! I am A HUGE fan of hers and have watched every show she’s made! Love her design and her personality–along with Tommy–so fun! I’m with those at the top of the comments that would turn over my house (with some of my input about desired aesthetics, of course;) to Sarah and Tommy without second thought. My DVR is set to record any and all Sarah Richardson shows-first run & rerun–I don’t want to miss a thing. So imagine how shocked I was when it recorded everything and I didn’t have the girl’s room, the living room and yes, the first find & buy episode:( Sad face over here. And I’ve been checking every few days to see if I can find it but there isn’t even ANY more runs of the show scheduled where I am. WTH?! I don’t understand why we aren’t seeing an incredible amount more of Sarah in the US let alone the full run of this show! So strange and terribly disappointing. The Farmhouse that Melanie shared is my favorite out of the three houses. The interior is gorgeous and done so well, I could see myself living there. My second favorite is the cottage. I love that vaulted ceiling. I love the work Sarah does, but am not a regular viewer of her shows. I *love* that kitchen, especially the lantern lights but you are so right about the endless gray. There’s this gorgeous not quite lime green I saw on the walls in a DIY show–that color (oh how I wish I knew what it was & what the show was) would rock that kitchen if mixed in with white. I missed the show on her summer cottage which about makes me cry now because that dining table & chairs as well as kitchen make my heart sing. I love the fabric pattern on the chairs. Serious chair envy here. It makes me grieve for the armchair I was talked into selling when I had to move several years ago–sigh, my biggest regret from the yard sale. Sarah Richardson is on my “Lotto Max” wish list. I would have her design and decorate my dream home. I’ve been a fan since her first show, Room Service, hit the airwaves waaaay back when. Her timeless designs and penchant for colour and pattern are her trademarks. Her furniture line is spectacular. The friendship chemistry between Tommy Smythe and Sarah is refreshing and entertaining. I can’t wait for Season 5. I love her stuff!!! I would LOVE a house like that!! But, my kids would destroy that in 5 seconds!! I actually watch her show all the way through. Love when her and Tommy play off each other.. Other shows I just skip to the end because everything in between is boring to me. I love Sarah Richardson. I recorded Saturday’s episodes and have watched them twice. I cannot wait to see tomorrow. I scrolled through the pictures from the rooms which will air tomorrow, so I will not know what to expect. I agree with your surprise over the way HGTV scheduled the show. Overall, I have disappointed with HGTV scheduling lately and would like more Sarah and Candice! I recently caught a marathon the her summer house series. Although I am not 100% in love with her style, I like the overall feeling she gives homes. My fav part about that series was watching her belly grow! She was super pregnant and looked great. I love Sarah’s House! I think the fact that she and Tommy are so unapologetically snobbish is what makes it so fun to watch. I was smirking over their whole conversation about ceramic tile in the master bath and her look of distaste. Honestly, you just don’t see that kind of high-end styling every day, which is what makes it interesting. Definitely a how-the-other-half-lives kind of thing! LOVE Sarah…best designer on television…just don’t get why hgtv hasn’t really realiized it. Great casual, liveable rooms – and fun to watch too! I am totally with you on not falling for the gray craze. BUT I will say, I think that kitchen is the prettiest of all the gray rooms I have seen because it has pattern and texture. Most of the rooms in this trend tend to be so monochromatic it would put you to sleep! Where is the joy in that? And a house should have joy! Right? LOVE Sarah. She is hands down my favourite designer/presenter. Her and Tommy together are fantastic! I always thought that America got to see shows before us (I’m in Australia) so was surprised that you haven’t seen the latest Sarah’s House. That show was the inspiration for when my husband and I built our house recently. Sarah gave me the confidence to make design/decorating choices that have really made a difference. I hope they continue with the ‘Sarah’s House’ shows. Sarah is definitely my favorite…i have her shows set to DVR…I was surprised to see the series back to back on Saturday…I watch them over and over…she is a true talent…and who cannot resist that Tommy…he is the funniest..they so compliment each other!…I am so happy to see the other rooms that have not aired yet…I am not liking that horse picture in the dining room…Thanks for the tour Julia….loved it! 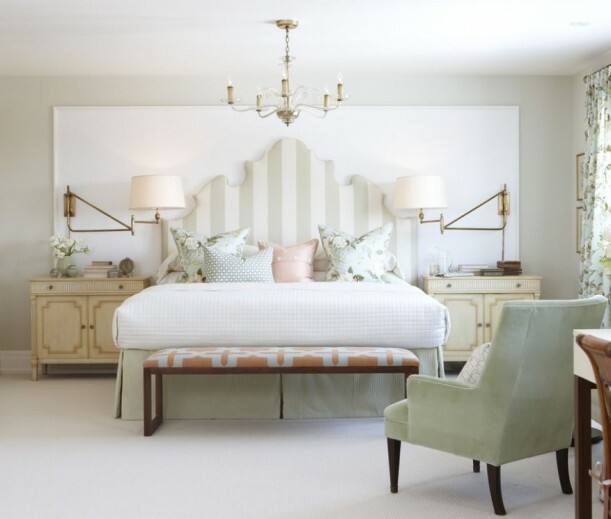 I love Sarah….her head boards are amazing! Amazing…..
She has talent but it isn’t my taste. I it’s generally too girly, too done and too pale for me. Even her casual looks seem formal. Could all of the popular bloggers start a petition to get Sarah on in the US on a regular, watchable basis? It’s amazing that her design aesthetic is not mine at all, but she’s still my favorite designer. Her designs are warm and cohesive (*cough* Novegratz) and impeccably finished. I wonder if it’s a money/contract issue that’s keeping them off of the air. I watched the marathon today and LOVE her designs but I was completely put off by the budgeting and pricing. She kept saying things like “oh these sconces are a steal at only $600” and “this whole desk is a bargain to be redone at $450”. In my reality, I spend $50 on a desk from Craigslist and paint it myself and maybe $100 for a light fixutre from Lowes or Home Depot. Her budget of $11,000 just to DECORATE the bedroom is not feasible. Show me the entire house decorated for $11,000 and then I’ll be impressed. Having said all that, her taste is exquisite. Sarah Richardson is the ONLY tv decorator that I would turn over my entire house to. If I ever win the lottery, I’m giving her a call. I sometimes don’t like one or two of the choices she makes for a room, but when it comes together, I always love it. She and Tommy are fun to watch, too. She and Tommy are my favorite dynamic design duo. I caught the marathon today and posted but haven’t published it yet. I love her style which is similar to mine I think. Thanks for sharing-we were thinking along the same line. I usually do Euro related posts but the house today featured a crafts room so I have to include it. Great job! Love Sarah’s style for the most part – sometimes it’s too much for me, though, but that’s ok. I LOVED the farmhouse and the cottage!! Even if you don’t like her style or the ridiculousness of her budget, you can take away a lot of good ideas and tips for decorating your own house from her shows. Now if only HGTV would recognize that the fans down here in the U.S. want to see more decorating shows from people like Candice and Sarah instead of how to sell our house or how to buy a new house. Ugh. I miss the old “Design Time Saturday Night” way back in the 90’s on HGTV…..
Love the house, love the horse. Maybe with bowls of fresh fruit and potted herbs the kitchen will come to life. Tommy is a hoot! Any of you remember the stair/escalator routine he did while he and Sarah were making cookies for her Christmas party? If I see another high energy, manic, cutsey host designer on HGTV I will frow up. Come to think about it, I don’t watch HGTV any more (other than Sarah). I watch Nicole Curtis (Rehab Addict) on DIY. I get my design fix on HOUZZ and right here at Hooked….., which I am. Did I go brain-dead, I didn’t see an episode for “Find/Buy”, “Dining Room” or “Girl’s Bedroom” — did they air in the US and I simply missed them?? Nope–they just decided to leave them out. How do you explain that, HGTV?! Idiots. LOL! I did not find out about the new season for Sarah Richardson until all episodes had aired.. I am so tired of real estate shows – I wait for anything new with designers actually designing. I have almost given up on HGTV. What?!?!?! How could they have crammed the long awaited whole series into 2 days…and WHY? If I have to watch one more “property brothers” marathon I think I will scream. I Love HGTV but am wondering if they have had a budget cut… Shows are pretty scarce. Ummm…I won’t be sending any auto announcements. Maybe you’re looking for HGTV.com? LOVE LOVE LOVE Sarah and Tommy !!!!! So great together !!! Want more !!! Sarah, in one of ur episodes you are wearing a wrap dress that I love. Need to know where you get your clothes please ???? This blog interviewed Sarah and answered your clothes ? I LOVE everything Sarah Richardson!! I can’t get enough of her shows!! It’s a shame HGTV doesn’t know what a fabulous show this is. It would also be fabulous to see an entire season shown in order and without skipping any of the episodes aslo!!!! So happy to find this blog!! The only room I’ve not liked so far that Sarah has done was the blue dining room. I see many people that posted here loved it but I thought the grasscloth on the walls showed seams, the color looked uneven and blotchy. I would have chosen to paint instead and I think that would have made a big difference. Anyway, Tommy needs to also get a lot of credit here. I think I agree with his design sense most all the time he and Sarah disagree on a design decision. His taste is simply eloquent. Together they design a room that has a mix of contempory with the right blend of traditional and it looks totally smashing and that is what makes all of the rooms they do look better than any other designer/design show out there. I’ve learned a lot from Sarah and Tommy and want to redecorate every room in my house. It would be so much fun to have a huge budget to play with where money is not an object to see if I could make every room look like a room designed by Sarah and Tommy! We see Sarah’s shows in South Africa as well and I simply love it! She is the most talented designer I have ever seen on TV. Episodes get repeated at least 6 times a week here and I try not to miss each repeat, no matter what time of day or night! I would love to meet her and Tommy (just love him too)! Any chance of coming for a visit to South Africa? I was flicking stations and noticed Sarah Richardson’s Summer House Marathon program. I started watching the first episode and now I have series linked everyone of her programs. I just love her programs. Her knowledge of interior design is amazing. I have learnt so much from watching her programs. I love her style, she is very inspiring and I love her sense of humour. She has a good rapport with her staff.I enjoy the programs with Tommy Smythe and look forward to seeing more. I wish she lived here in Perth ,Western Australia. I would love to be a client of hers. We don’t have the same amount of resources and products as in America or Canada. The shops over there look amazing. I would just love to be able to visit them one day.I would have to have a container to bring all the things I buy home. Anyway I am so glad to was flicking channels, I love Sarah Richardson’s programs.!!!! Please give us more Sarah…… She and Tommy are terrific together…HGTV should listen to their potential viewers…we love Canada too. Love Sarah and Tommy. When is her show on? I can’t seem to find it. All we seem to have here in California is Love it or List it for hours and hours. Sarah Richardson is my absolutely favorite designer, and I, for one, like the horse picture. I wish she would come out with a book containing her impeccable advice and lots of big pictures.